In particular, New Haven’s downtown area will provide plenty of photogenic locations for you to explore on your wedding day. Begin your photo shoot at the historic City Hall, one of the early bastions of High Victorian Gothic architecture in America. Have your wedding photographer assemble a portrait of the entire bridal party, staggered along the front steps of the structure. The arched entrances at the front of the building will also work well for an intimate photo of the bride and groom. As you work your way along the gorgeous City Hall exterior, you and your wedding photographer will create countless amazing wedding day memories! Next on your wedding photography itinerary in downtown New Haven is the city’s famous Union Station. As you enter the station, you’ll be greeted by a beautiful limestone interior. The inside of the station is filled with stylish chandeliers that hang from ornate ceilings, creating an atmosphere of elegance and charm. Ascend to the second-tier balconies and have your wedding photographer capture private moments between the bride and groom, bathing in the light that floods the station’s interior through the arched windows. You can then scatter the bridal party among the wooden benches throughout the station for some fun and laid-back wedding photos. The final stop on this New Haven wedding photography itinerary is East Rock Park, a popular location for tourists and New Havenites alike. Peruse the numerous winding trails that dissect the park as your wedding photographer captures some candid shots. Organize a group portrait of the bridal party on the any one of the park’s lush green lawns or take a photo beside the park’s famous Soldiers and Sailors Monument. Finally visit the Pardee Rose Garden and Greenhouse and have your wedding photographer take photos with the vibrant floral treasures in the background. One of the most renowned of downtown New Haven’s features is Yale University, the third-oldest higher learning institution in the entire country. Start off your tour of this Ivy League school in front of the unforgettable Gothic Revival-style Harkness Tower. Move on to the capacious Battell Chapel, another High Victorian Gothic structure, where your wedding photographer can assemble portraits at the arched front entrance and within the spacious and elegant interior. Phelps Gate, located on the Old Campus, is a stylish archway that is perfect for a silhouetted portrait of the bride and groom. The Sterling Law Building, which occupies an entire New Haven city block, is a stunning place to explore with your wedding photography and bridal party. Finally, take your bridal party to the Hewitt Quadrangle, located in the heart of the Yale University campus. Here, your wedding photographer can use the stunning Beaux-Arts architecture of the Woolsey Hall, as well as the gorgeous Memorial Rotunda as background for some truly remarkable wedding photos. Once you’ve explored most of the Yale University campus, stroll over to the New Haven Green, a popular location for wedding photography, as well as for public recreational events in New Haven. Have your wedding photographer organize portraits of the bridal party on the expansive, verdant lawns throughout the park. 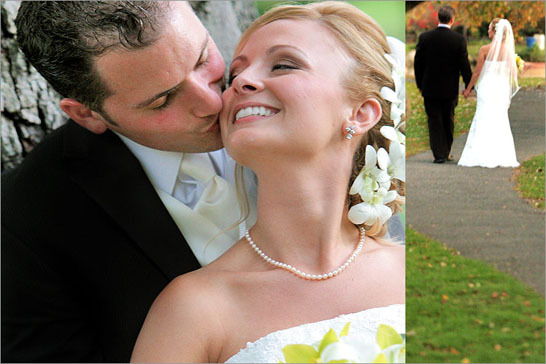 Take some candid photos of the bride and groom as they meander along the walkways or relax on the park benches. Finally, walk over to the Center Church on the Green, a historic chapel whose architectural style is reminiscent of New Haven’s Colonial beginnings. Have your photographer organize shots on the church’s front steps, beneath its towering columns, or right at the front entrance. You'll love exploring the one of the country’s most prestigious universities during your wedding photography session. Lighthouse Point Park is truly one of the jewels of the New haven, Connecticut - a favorite of locals and tourists, as well as newlyweds. 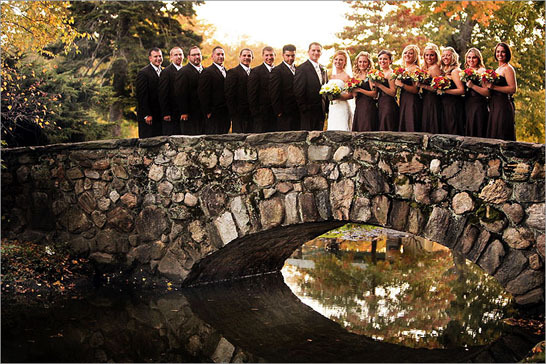 The park offers a pier overlooking Long Island Sound, a perfect location for an intimate photo of the bride and groom. 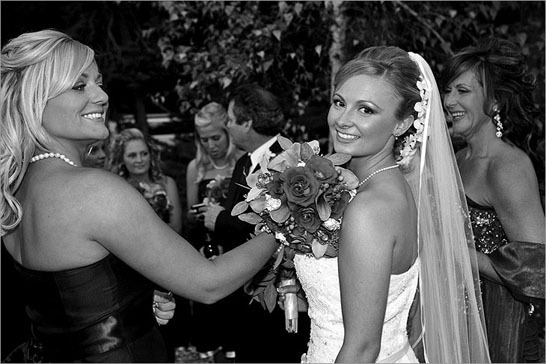 Take your bridal party along for a walk through the park and have your wedding photographer snap some candid shots. For some fun on the playground, have your wedding photographer organize some photos of the groom pushing the bride on the swings, of a groomsmen-vs.-bridesmaids battle on the seesaw, or even of your bridal party riding the carousel! You can also explore the park’s colorful Butterfly Garden, whose brilliant hues will provide a great background for your wedding photos. Finally, no wedding photo shoot at Lighthouse Point Park would be complete without visiting the lighthouse, itself. Whether seated on the rocks or standing in front of the towering structure, itself, you’ll create plenty of special, unique wedding day memories at New Haven’s Lighthouse Point Park!